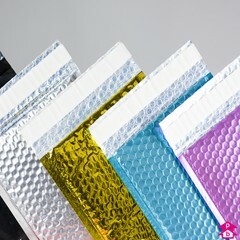 Light protective bubble-lined envelopes designed to make a big impression on your customers. This range of colourful metallic and sparkling holographic mailing bags also have peel-and-seal adhesive strips for easy sealing. 8 Products. 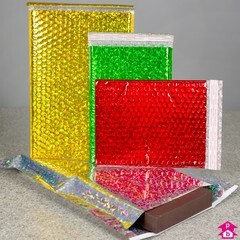 Fun and funky bubble-lined foil mailing bags that sparkle with a holographic light effect. Great for wowwing your customers, with peel-and-seal adhesive strips for easy sealing. 11 Products. 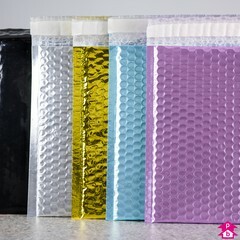 Attractive bubble-lined mailing bags available in five glossy colours making them perfect for luxury mailings. With peel and seal adhesive strips for easy sealing.